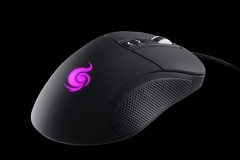 Next in the CM Storm line-up review comes this rather neat little mouse – the Mizar. I really like this product. 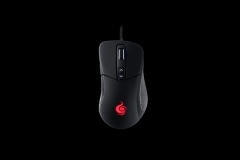 It’s a mouse with a pedigree deeply connected with gamers, evidenced by the comprehensive macroing features it includes. The Mizar’s weight feels perfect in my hands and the contours are spot on for my hand which I would describe as average sized. 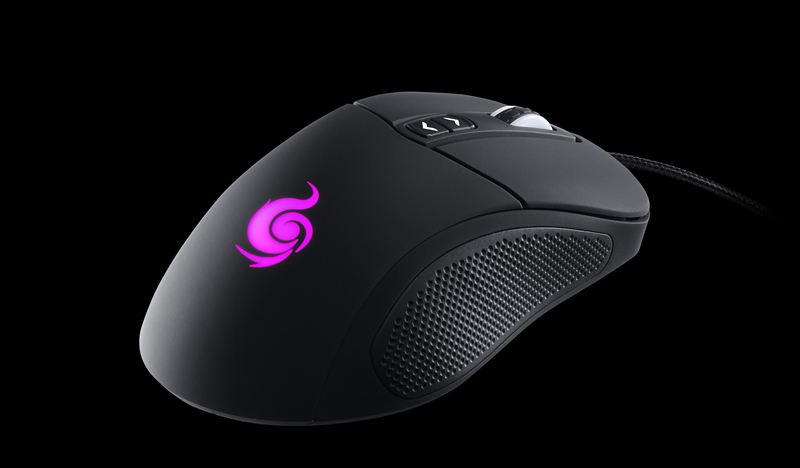 It’s a nice looking mouse with the CM Storm logo really standing out thanks to the uniform LED lighting that lurks beneath it. Tracking speed is denoted via the colour of the logo, which is great if you have kids for example who need a slower tracking speed. I’m happy with red which is the second fastest, but perhaps if I was a Korean Starcraft 2 grandmaster I’d prefer the fastest – blue! Figure1: Note the 4 default stages of tracking denoted by colour – white for Granny/kids and blue for maniacs! 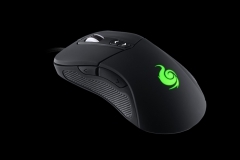 The mouse wheel and tracking speed buttons are illuminated in white which looks great. 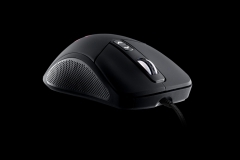 The sides of the mouse sport a rubber mesh which grips well and isn’t sweaty. The mouse wheel itself has a rubber grip which feels nice and exact. 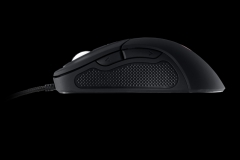 In total there are 7 buttons, mouse wheel itself, left and right mouse buttons, two macro-able buttons within thumb range on the left hand side and two tracking buttons. Cooler Master have a neat software utility that can be downloaded to perform configuration tasks on the Mizar. The GUI is very easy to use and full credit to Cooler Master for creating such a nice functional utility. A total of 4 profiles can be accessed at any one time via the tracking/ DPI buttons on the mouse, and each one of those profiles can have granular settings for button assignment, DPI rate, macro assignments and LED lighting. Additional profiles can be made and saved to disk for future use. The LED options are nice and I particularly like the “breathing” LED mode whereby the LED seems to come on and then fade out slowly, almost like it is pulsating. There is also an interesting feature called “Angle snapping” which according to the Mizar manual is a type of “path correction in mouse sensors that assists in drawing horizontal or vertical lines (useful in graphical applications)”. I use Visio and am pretty unco at drawing straight lines so perhaps this feature could help. For testing the macro feature I created a simple new tab in a browser function and mapped it to Button 5 (thumb closest to wrist) and it worked a treat. 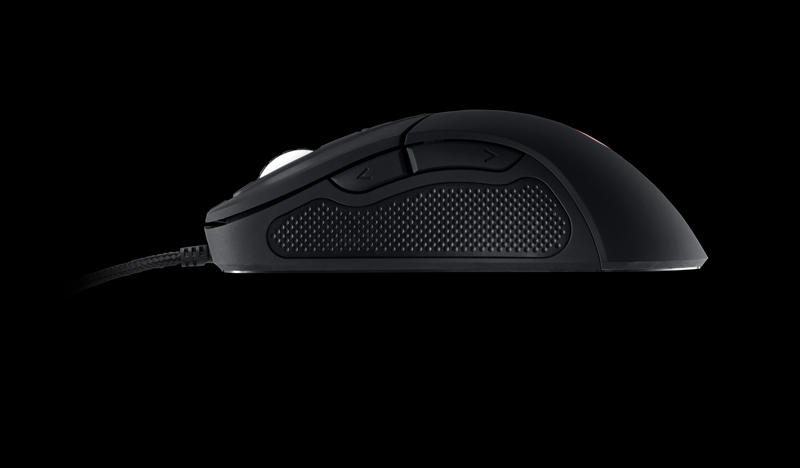 You are going to be able to macro pretty much anything with this mouse. Just something to be aware of, when assigning a macro from your “Library” to your mouse, don’t click the “Apply” button down the bottom as that applies to your profile selection. Instead you want to click the right facing arrow in the Library tab to effectively push the macro to your mouse. Boasting an 8200 DPI laser I expected this mouse to be more than capable and indeed it is that. The mouse glides around the table (I prefer no mouse mat) with ease and the pointer accuracy is excellent. Having played some Battlefield Hardline using this mouse I can certainly say it is very accurate and responsive. Buttons engage with the right amount of pressure, and the left hand side thumb buttons are very easily accessible in a hurry. We were able to move the mouse between PCs in the lab and every time the Mizar worked flawlessly from a plug and play perspective. 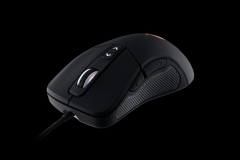 All LED settings and macros are retained within the EE-prom on the mouse and as such are portable, the PC does not require any special software on it whatsoever. This is a great product and it comes highly recommended. It has just the right amount of features and at $60 – $75 is excellent value. 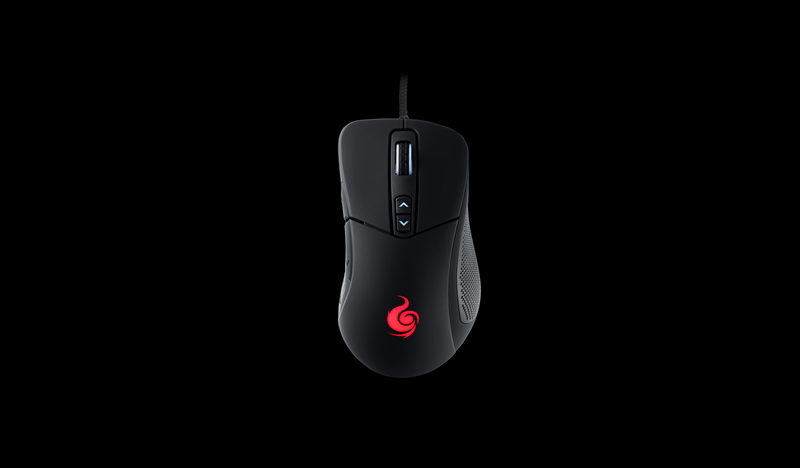 The mouse is certainly well-priced compared to some of its competitors. 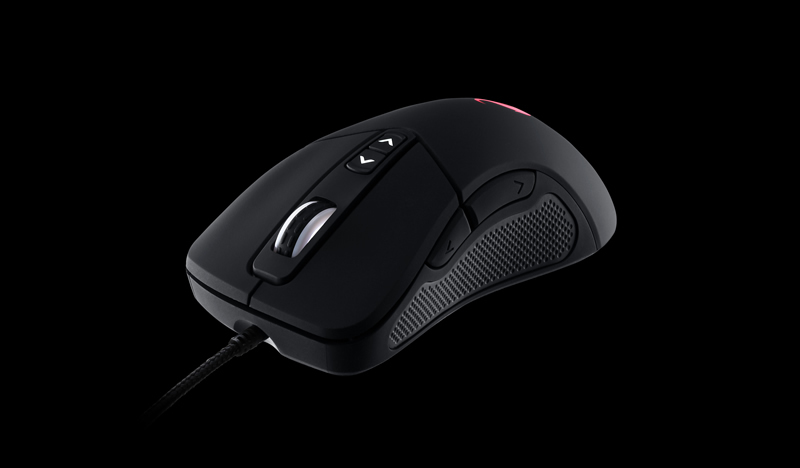 It lacks the game detection features of some of those higher priced mice but performs admirably in the most important facets and as such receives the coveted PC Gamers Editor’s choice award.